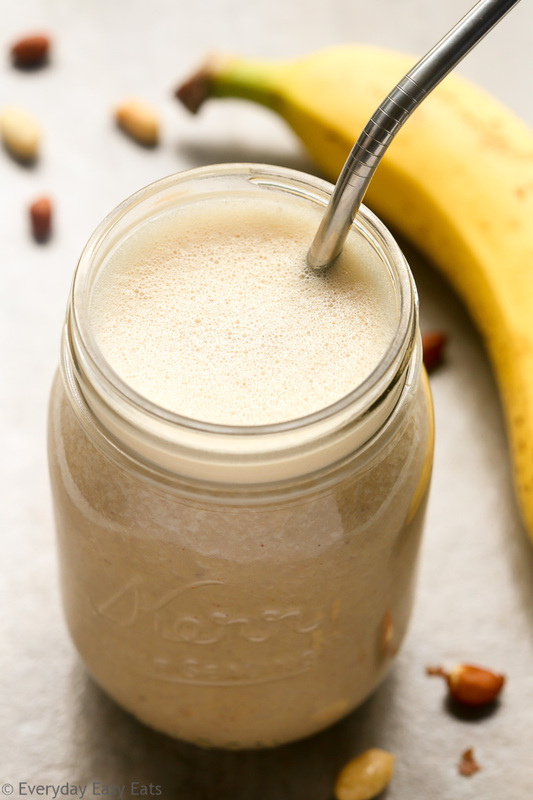 This nourishing Peanut Butter Banana Protein Shake recipe is the perfect way to start your day or replenish your body after a workout. It is super easy to make and is refined sugar-free. Made with clean ingredients like peanut butter, banana, natural protein powder, milk, honey and vanilla! This delicious, energizing smoothie is made with simple everyday ingredients and is ready in just 5 minutes. It makes a healthy, protein-packed breakfast that will kick-start your day and will keep you feeling full all morning. This recipe also makes an ideal post-workout shake that will refuel your energy and help your muscles to heal and build after exercising. 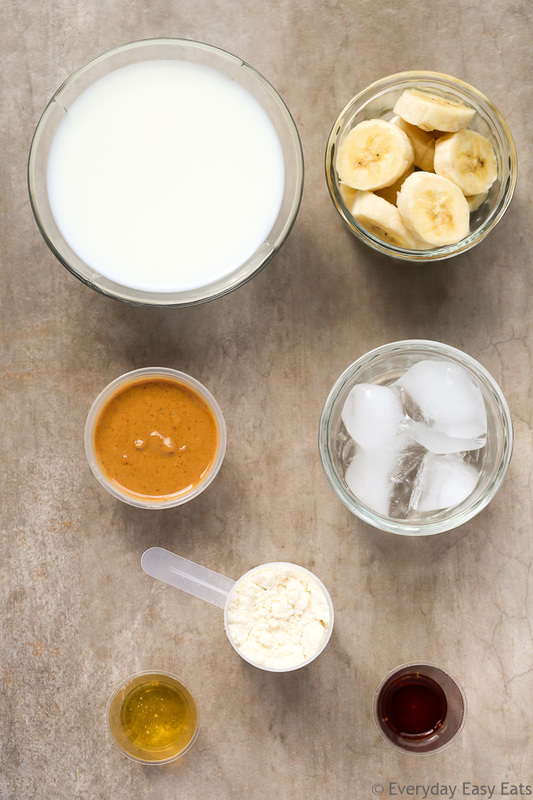 Simply add all of the ingredients – milk, banana, peanut butter, ice, honey, vanilla extract and protein powder – to a blender and blend until smooth and creamy. If drinking a protein shake is a part of your regular breakfast routine, I highly recommend checking out SmoothieBox. SmoothieBox is a monthly smoothie kit delivery service that is organic, nutrient-dense and free of added sugars. Each box comes with 20 smoothie packs that are filled with frozen fruits and vegetables, nuts and grass-fed collagen protein. Each shake is ready in less than 3 minutes and tastes absolutely delicious! The cost is just $5.95 per smoothie and delivery is FREE. If you want to make your mornings super easy while enjoying a healthy, nourishing breakfast at the same time, give SmoothieBox a try. 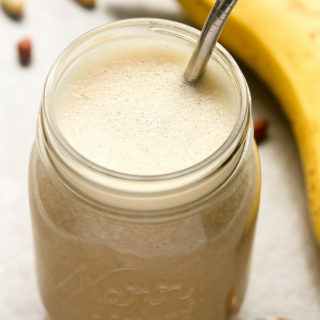 This quick, nutritious Peanut Butter Banana Protein Shake recipe is the perfect way to start your day or replenish your body after a workout. OH WOW this makes the perfect breakfast. My son is a gym and fitness fanatic and when I showed this recipe to him , he tried it out for breakfast this morning and absolutely loved it. It really is delicious.Thanks for the great recipe . Love it!!!? I just tried this recipe and it was delish!! Thank you for the easy instructions! I will definitely be trying more recipes! Hi Samantha! Thank you so much for letting me know, I’m so glad you enjoyed the shake! You’re very welcome and I’m excited for you to try more of my recipes!